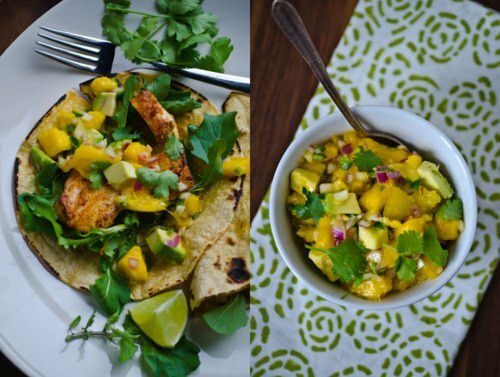 We have a permanent love affair with Mexican food in my household. Rarely a meal goes by without some salsa hitting the plate. 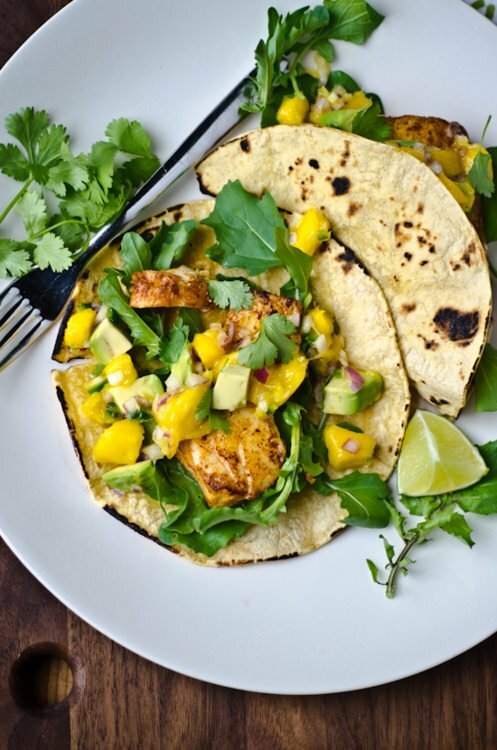 Tacos are the perfect foil for any kind of filling you can dream up, black beans, grilled chicken, tofu, carnitas, mushrooms and chard, I am always looking for a new combination to grace our plates. The one thing that I don’t usually experiment with are fish tacos since I am the only one in the house that will eat any kind of seafood. 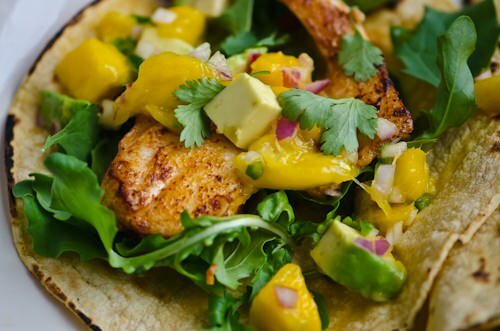 Since the Food Matters Project recipe this week called for fish with fruit salsa I knew that tacos were the way to go. You can have these on the table in 30 minutes or less and are a great healthy alternative to the usual greasy fare. Be sure to check out the original recipe and other versions at The Food Matters Project! Combine the paprika, cumin, salt and pepper in a small bowl. Rub the spice mixture over the fillets. Heat a large skillet over medium heat. Add the oil to the pan and cook the fish 2 minutes on each side or until done being careful not to overcook. Remove from heat and keep warm. 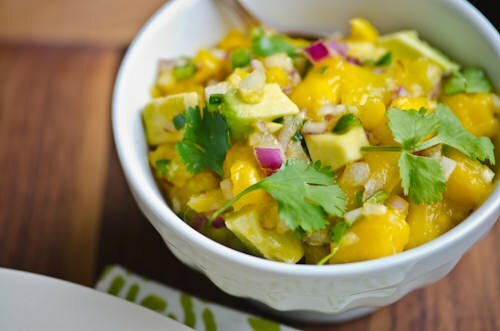 Combine the salt, avocado, mango, onion, jalapeño, cilantro and lime juice. Season with salt and pepper. Heat tortillas over an open flame until slightly charred and softened. 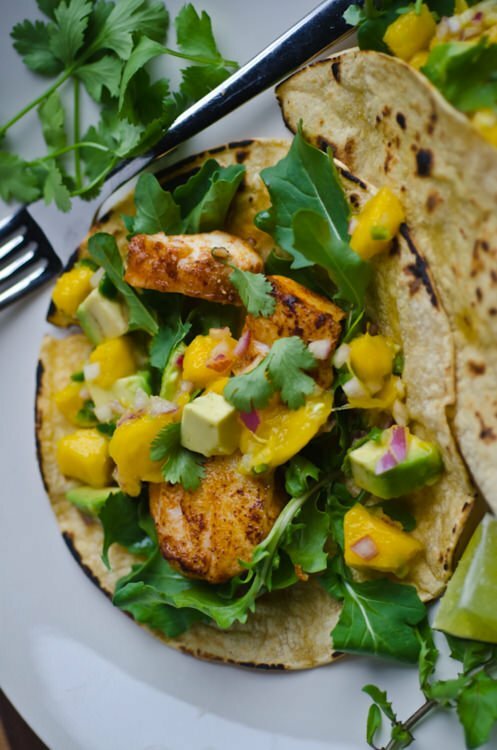 Break the fish into pieces and divide evenly among tortillas. Top each tortilla with 2 tablespoons salsa and serve. How many would you say this serves? 4ppl? Yes, you should be able to get 4 servings from this recipe.